A summer love... Forced to choose between love and friendship... 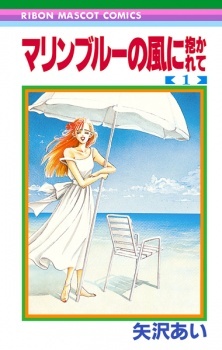 The boy of her dreams leaves for the U.S.... Tachibana works in a beach side cafe and roams the beach sands with her dog, Dolphin. Then her friend Ippei loses a surfing challenge to a newcomer. With a shock Tachibana recognizes Arikawa, her first love—her first heartbreak. After four years he's back from the U.S. and he thinks Tachibana doesn't like him. But before they get a chance to talk Ippei challenges Arikawa to another surfing match—in the face of an on-coming hurricane! Marine Blue no Kaze ni Dakarete will be published in Spanish by Planeta Comic in 2017.